Pro­ce­dur­al gen­er­a­tion is awe­some! In this tuto­r­i­al series we’ll look at mak­ing mesh­es using Blender’s Python API. Cre­at­ing mesh­es pro­gram­mat­i­cal­ly opens many pos­si­bil­i­ties. You can cre­ate para­met­ric objects that respond to real world set­tings, gen­er­a­tive art, math based shapes or even pro­ce­dur­al con­tent for games. Blender is a great choice for this kind of work since it com­bines a full blown mod­el­ing and ani­ma­tion suite with a pow­er­ful (and fair­ly well doc­u­ment­ed) Python API. In this series we will be look­ing at mak­ing sev­er­al prim­i­tives and some basic trans­for­ma­tions, I’ll also drop some tips along the way to make devel­op­ment eas­i­er. I’m assum­ing you already know some basic Python, and enough Blender to get around. For this intro­duc­tion we’ll skip the 3D and focus on mak­ing a sim­ple flat grid instead. The Blender data sys­tem makes a dis­tinc­tion between mesh data and objects in the scene. We have to add a mesh and link it to an object, and then link that object to a scene before we can see any results. Let’s start by import­ing bpy (sur­prise!) and set­ting up some vari­ables. Name will be both the mesh and object’s name, while rows and columns will con­trol how many ver­tices the grid has. Next we set up the mesh and object adding part. We have to add a mesh dat­a­block first, then an object that uses that mesh and final­ly link them to the cur­rent scene. I’ve also added some emp­ty lists for verts and faces. We will be fill­ing those lat­er. Try run­ning the script now. You will see a new object has been added but there’s no geom­e­try to be seen (since we haven’t added it yet). With the basic scaf­fold­ing done, delete that object and read on to start build­ing the grid. Now we can see the ver­tex grid in all it’s glo­ry. We can start mak­ing faces now, but first we need to under­stand how. Each vert we added has an index num­ber. Indices are set as we add each vert, so the first one is 0, the sec­ond is 1 and so on. If you get any­thing from this tuto­r­i­al I hope it is debug mode. It’s the most use­ful set­ting you can have for mesh mak­ing and even gen­er­al addon devel­op­ment. To see the ver­tices indices, select the 2D ver­tex grid and go into edit mode. Open up the N-pan­el and tog­gle “Indices” in the Mesh Dis­play Pan­el. It’s under the “Edge Info” col­umn. If you can’t see it, you might not have enabled debug mode yet. Now any ver­tex you select will show it’s index, so select them all to see their indices. Try run­ning the script again and… wait, some­thing looks wrong! It looks as if we con­nect­ed the wrong ver­tices. Well, we did con­nect the right ver­tices but in the wrong order. Yes, there is an order to fol­low when set­ting up faces: counter-clock­wise start­ing from the low­er-left. There­fore the order for the face is 0, 5, 6, 1﻿. Fix that line and run the script again. All index­es jump by 5 in the X axis. This is equal to the num­ber of rows. We can fig­ure out the first index in a loop by mul­ti­ply­ing the cur­rent col­umn by rows. Since the sec­ond one is off­set by 1, we just have to add 1 to get it. Try print­ing these val­ues to check them out. You might be won­der­ing why we are loop­ing over columns - 1. We have 10 columns of ver­tices, but these only cre­ate 9 columns of faces. The last col­umn doesn’t con­nect to any­thing after it. The third and fourth indices are (x + 1) * rows + 1 and x * rows + 1 respec­tive­ly. We add 1 to X before mul­ti­ply­ing to set the index on the next row. Armed with all this knowl­edge we can now build the first row of faces. But before we get to that, let’s sep­a­rate the face code into it’s own func­tion so we can keep the code nice and clean. I have also added sup­port for mak­ing a face on any row. Rows make indices increase by 1 as you they up the Y axis, so we can just add the row num­ber at the end. We use rows — 1 for the same rea­son we did columns. Run the script and behold. And with that the grid is now com­plete. You have made a script that can cre­ate 2D grids! Pat your­self in the back and keep read­ing for some fin­ish­ing tweaks and chal­lenges. We can con­trol how many ver­tices our grid has, but the squares are always exact­ly 1 BU in size. Let’s change that. All we have to do is mul­ti­ply the X and Y coor­di­nates by a scale fac­tor. Start by adding a size vari­able. We can add this direct­ly to the verts expres­sion but again, it is clean­er if we do it in it’s own func­tion. Try set­ting size to some­thing oth­er than 1 and check the grid. 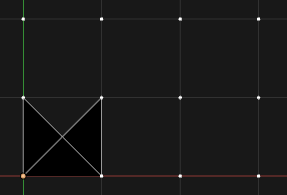 Add an off­set so the Grid doesn’t start at (0, 0). Stay tuned for the next tuto­r­i­al where we final­ly go 3D with cubes. will cre­ate 10 ver­tices. Not 5 as stat­ed in the text. For cre­at­ing the first face you state we should use the verts in a counter clock­wise fash­ion. So shows your dia­gram. But your order of (0, 1, 5, 6) is actu­al­ly clock­wise count­ing. CC would be (0, 6, 5, 1). The dif­fer­ence? I’d rather told you this in a PM but I’m new to this whole Diqus thingy and don’t even know if thats pos­si­ble. So I hope it’s not to both­er­ing here in pub­lic. That said I tried to avoid going into the nor­mals thing for this series, unless they were giv­ing trou­ble (like in the last part). Dis­qus doesn’t have DMs AFAIK, but you can always send me an email at diego@sienstesia.co. This was only the 2nd or 3rd tuto­r­i­al I made, so I do appre­ci­ate some con­struc­tive feed­back!